Our regular weekend service schedule is below. For up-to-date information on all of our services, including descriptions, locations, and special celebrations, please visit our Worship Calendar. Our Saturday evening service is in our chapel. We hear three separate readings from the Bible, and say some verses from a Psalm. The sermon usually focuses on our daily life as viewed through the prism of the scripture readings. Normally, we recite the Nicene Creed together, corporately confess our sins, and pray together for one another and for the world. Then we celebrate the Eucharist. We are typically finished by about 5:45 PM. Our early service is in our chapel. We hear three separate readings from the Bible, and say some verses from a Psalm. The sermon usually focuses on our daily life as viewed through the prism of the scripture readings. Normally, we recite the Nicene Creed together, corporately confess our sins, and pray together for one another and for the world. Then we celebrate the Eucharist. We are typically finished by about 8:45 AM. At our main service, there is an abundance of singing, led by our organist and choir. We hear three separate readings from the Bible, and sing some verses from a Psalm. The sermon usually focuses on our daily life as viewed through the prism of the scripture readings. Normally, we recite the Nicene Creed together, corporately confess our sins, and pray together for one another and for the world. Then we celebrate the Eucharist. We are typically finished by about 11:15 AM. We have a great commitment to the importance of including the younger members of our parish in our common life. Children’s Chapel is offered throughout the school year. Children start the service with their parents and are invited downstairs during the Song of Praise. Children will hear the story in a child-friendly way, sing songs, and share prayers. The children come back to the service for a Children’s Sermon just prior to the exchange of the Peace. 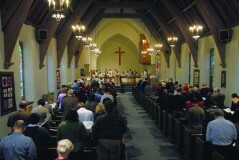 Our Wednesday service meets in the Chapel. We often use an alternate liturgy, such as one from Enriching Our Worship, or the New Zealand Prayer Book. We hear about the life of a saint from Holy Women, Holy Men, and discuss how their story interacts with our lives or our reading of the biblical texts. We often offer Laying on of Hands and Anointing as part of this service.